Russian court dismisses $300,000 claim against Transaero air carrier’s ex-Board Director | Russian Legal Information Agency (RAPSI). MOSCOW, March 4 (RAPSI) – The Commercial Court of St. Petersburg and Leningrad Region has dismissed a 20 million rubles (about $300,000) claim lodged against Transaero former top manager Olga Pleshakova, the court documents read on Monday. 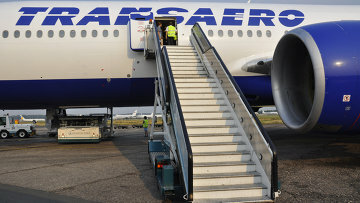 The court therefore refused to rule in favor of the air company’s bankruptcy supervisor Alexey Belokopyt, who asked the court to invalidate certain transactions carried out by the former director as the operations in question were made immediately prior to Transaero bankruptcy. Earlier, Belokopyt has demanded to recover about 81 million rubles (about $1,2 million at the current exchange rate) from the company’s ex-founder and his family. The supervisor asked the court to quash the transactions related to the payment of Transaero dividends in 2013 and return the funds plus interest to the bankruptcy estate charging the money from the former founder of the company, his mother, wife and two daughters. Transaero found itself unable to pay its debts valued at 250 billion rubles (about $4 billion) in 2015. The government-approved plan of transferring 75% of company’s shares to Aeroflot failed. Its problems resulted in a large number of flight cancels and delays. In October 2015, Sberbank and Alfa Bank filed bankruptcy petitions against the troubled airline. The Commercial Court of St. Petersburg and Leningrad Region initiated bankruptcy procedure against Transaero on December 16. On September 13, 2017, Transaero was declared bankrupt. 14:21 04/03/2019 The Commercial Court of St. Petersburg and Leningrad Region has dismissed a 20 million rubles (about $300,000) claim lodged against Transaero former top manager Olga Pleshakova.